This week, my friends were craving for pizza. Each time we use store-bought pizza sauce, it ends up to be very salty. My Peruvian friend found a great pizza sauce recipe, very easy to make. Even a person that does not know how to cook can follow simple instruction. No cooking required. To get the best taste out of it, prepare it a few hours or a day in advance. 1. 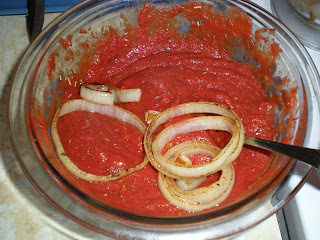 Mix well together tomato paste, water and olive oil. 2. Mix in onion, garlic, oregano, basil. Season with salt and pepper to taste. 3. Refrigerate for a few hours to blend flavors.